In my marriage, one of us is the “voice of reason” and the other of us believes that if an idea pops into one’s head, one should begin implementation as soon as possible. Can you guess which one I am? Ever since I read Gorgeously Green: 8 Simple Steps to an Earth-Friendly Life, I have felt I should start a compost. 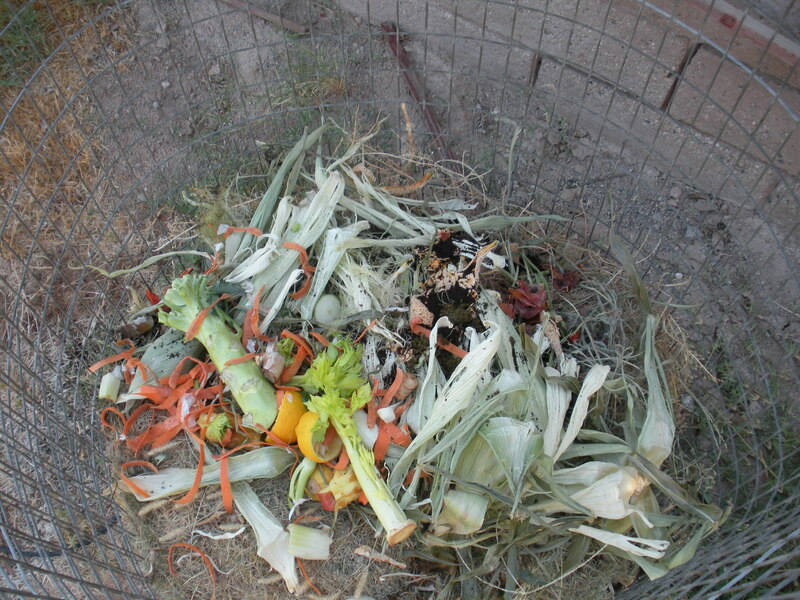 I have become more mindful of the scraps of fruits and vegetables I throw into my trash can that will ultimately end up in a landfill – things I could be composting and giving back to the earth. Also, since I’ve recently started my garden, a supposed-compost heap could be added to my crops and I would then have mega-enriched herbs and veggies. The only problem? I live in an apartment. A few months ago, my parents attended a Sierra Club meeting where the guest speaker talked about compost. After that, my mom became determined to start a compost heap in their backyard. “Why not buy a container and some worms and compost under your sink?” my mom suggested. Excellent idea! But when I presented the idea to my husband, he had to get all sensible on me. “What about the smell? Wouldn’t our cat kill the worms? It’s too messy. They’ll evict us.” Bah! So I’ve settled on occasionally collecting my compostible material and taking it over to my parents’ house. I even did an experiment recently where I measured our daily trash output vs. our daily compostible output. We’re still too heavy on the landfill only items and I have been trying to cut back by buying less processed and packaged foods and by not putting my produce in plastic baggies at the grocery stores (very wasteful in my opinion when you have to wash them before eating anyways!). Landfill material on left, compost material on right. I feel terrible that this was our second bag of trash in one day. What can be composted: Whatever comes from the earth can go back to the earth. Compostible items include fruit and veggie scraps, apple cores, banana peels, used tea bags, coffee grounds, leaves, grass, wood chips, dried flowers. Things that don’t compost: animal fat, dairy products, meat products, bacon grease. Coffee grounds are really good to add to compost piles. If you’re not a coffee drinker, I’ve heard that by making nice with Starbucks, they’ll give you free used coffee grounds for your compost heap. Insects shouldn’t be a problem because ideally the compost heap should be hot and insects won’t survive. When to turn it? A good rule of thumb is: If it’s hot leave it, if it’s cold turn it. Where to buy a composting bin? The Spring Preserve, where I’ve been taking my gardening classes, said they buy the bins for their composting classes from Peaceful Valley. Some people also said you can even buy composting bins at WalMart, but since I haven’t been to WalMart in years, I’m probably not the one to ask. And if you’re interested in learning more about how to compost check out the website http://www.howtocompost.org/ – a great place for beginners to start. While I still haven’t accepted that people living in apartments cannot compost, for now I’ll have to accept saving my scraps for my parents’ bin. 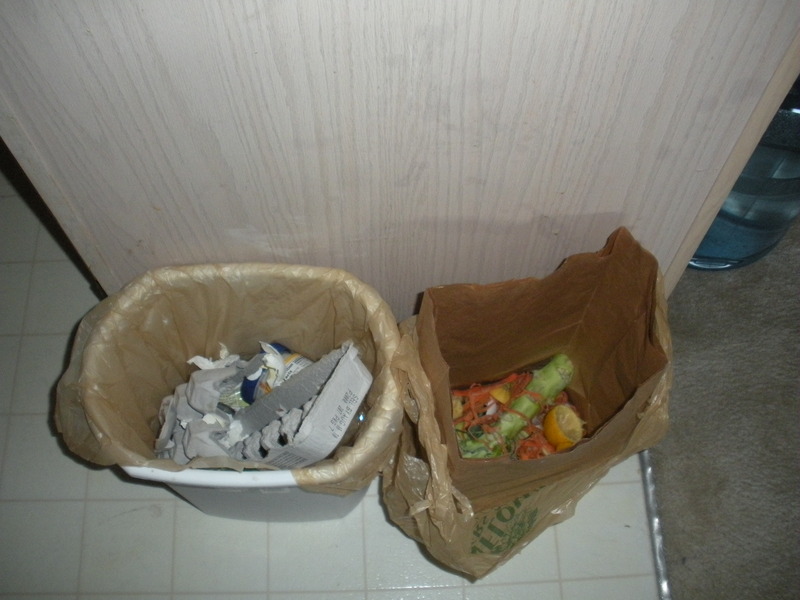 This entry was posted in Green Living, The Simple Living Experiment and tagged apartment composting, compost, gardening, Green Living, landfills, trash. Bookmark the permalink. 1 Response to Composting in my apartment? The first time I heard of a worm compost bin, I thought it was gross too. However, I think they’re pretty good indoors. I don’t think the cat would get into it if you keep it under the sink. I’m not sure about the smell.